April Recap - A New Paradigm? In recent months, the charts have fostered deep and prolonged personal transformation. Public awareness has been deepened and refined; our assumptions about the world and its many issues, economic, political, social and cultural, foreign and domestic, have evolved significantly. We are revisiting many issues, especially issues of political and economic fairness. A new worldview, distinct from the one we have held for so long, is clearly emerging. 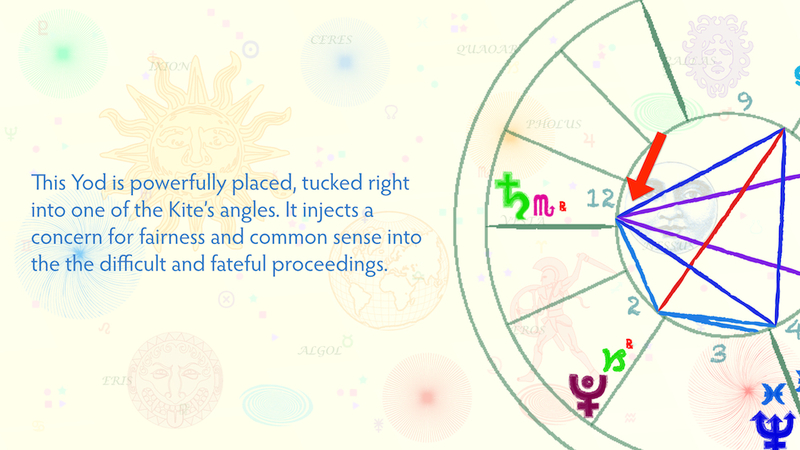 April’s Kite is anchored in financial signs; it is organized around the financial axis of the chart. Accordingly, April's eclipses suggest a watershed moment in the struggle between the 1% and the 99%. The Grand Cross in Cardinal Signs suggests that the changes triggered by the eclipses will be unusually dramatic and decisive for our economic prospects, among other things. Change is already well beyond the speculation and discussion stage. It is clear from the headlines about pot legalization, possible minimum wage increases, revisions in drug sentencing laws, unionization efforts, and so on, that societal attitudes are changing and so are public policies. 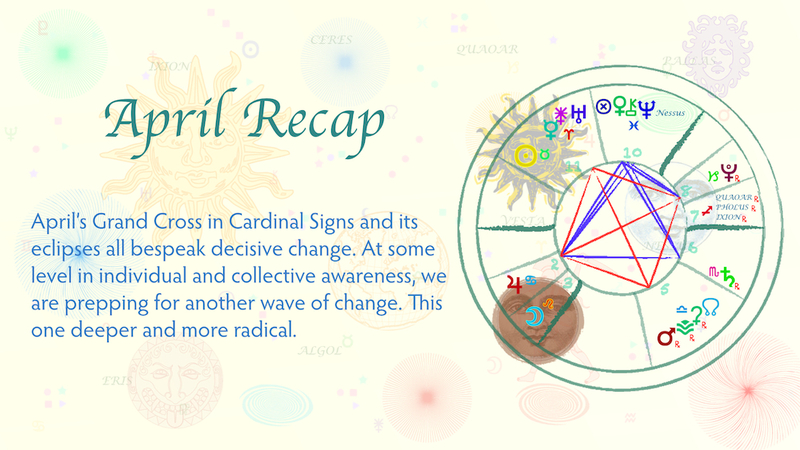 April’s Grand Cross in Cardinal Signs and its eclipses all bespeak decisive change. At some level in individual and collective awareness, we are prepping for another wave of change. This one deeper and more radical than the last. With reference to the idea of a new paradigm, public discussion is in fact more inclusive. The old, partisan oversimplifications and half truths are gradually, grudgingly giving way to more complex, varied and factually accurate views. There are more perspectives from which to view issues and, increasingly. The turmoil in Ukraine concerns many of us and I have taken the course of that conflict as a test case for the new paradigm. Will it proceed along the lines of the old paradigm, with a progressive hardening of positions and a series of provocations and mounting confrontations? While still dangerous, and reminiscent of many other, similar, conflicts, it has not yet fallen into any of the old patterns and it is still not clear that it will, although that is still possible. Indeed, the depth and complexity of the relationship between Europe and Russia works against a reflexive, confrontational approach. On Friday, April 24th, USA TODAY sent out a bulletin with a reference to Ukraine. It was entitled,: "Stocks slammed by specter of 'World War III'". The old fears are still out there and they are not unjustified. Even if a new paradigm is taking hold in the world, it is not clear that its influence is strong enough or its reach deep enough, yet, to affect the Ukraine crisis. The effects of April’s chart might tell the tale. 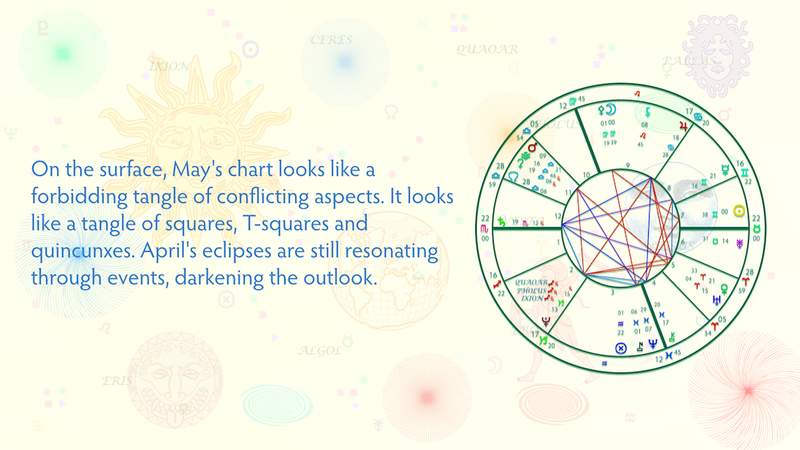 On the surface, May's chart looks like a forbidding tangle of squares, T-squares and quincunxes. April's eclipses are still resonating through events, too, darkening the outlook. Worrisome things will doubtless take place; people will be forced to make tough choices under difficult circumstances. Crises will occur. Certain worrisome situations will worsen. We must consider, though, that many of the negative events might be the result of a negative dynamic that is now fading. They might mark the end of an era. We must be realistic about the power of these difficult aspects, and deal realistically with the dark events they will bring. 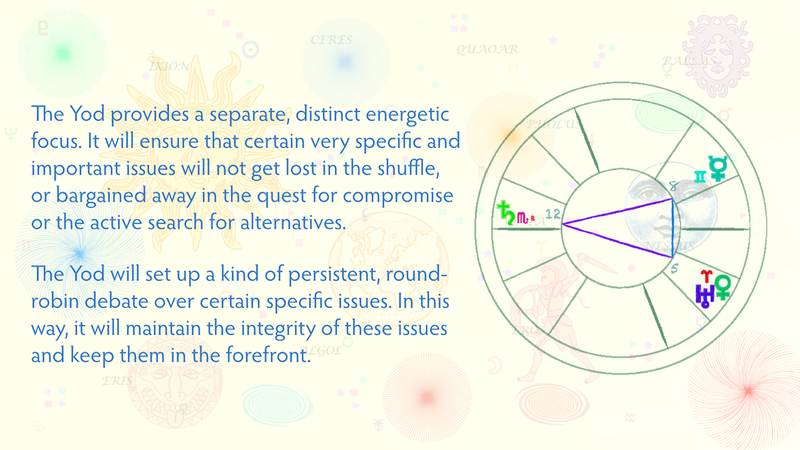 But we must not let them obscure the strongly supportive elements in May's chart. Similarly, when interpreting world events, we must acknowledge the harsh realities, but not let them conceal from our view the reality of other, more promising developments. A Kite . . . 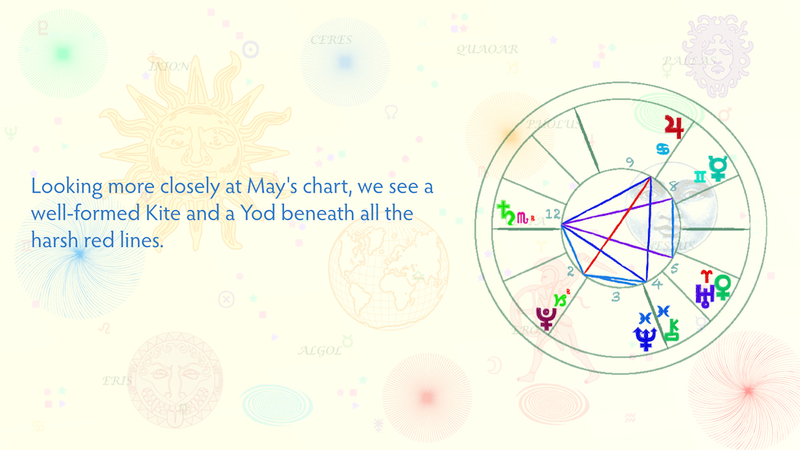 Looking more closely at May's chart, we see a well-formed Kite and a Yod beneath all the harsh red lines. Pluto is retrograde in Capricorn in the 2nd; Neptune and Chiron are in Pisces in the 3rd and 4th, straddling the IC; Jupiter is in Cancer in the 9th; Saturn is retrograde in Scorpio in the 12th. All are linked harmoniously by the Kite’s system of trines and sextiles. The Kite provides dynamic balance, much the way a gyroscope does. It is self-correcting. The heavy, spinning wheel in its center keeps the gyroscope steady and provides stability, direction and guidance. + an Opposition . . .
Pluto is retrograde in Capricorn in the 2nd house of grassroots finances. It opposes Jupiter in Cancer in the 9th house of philosophy and ideology. 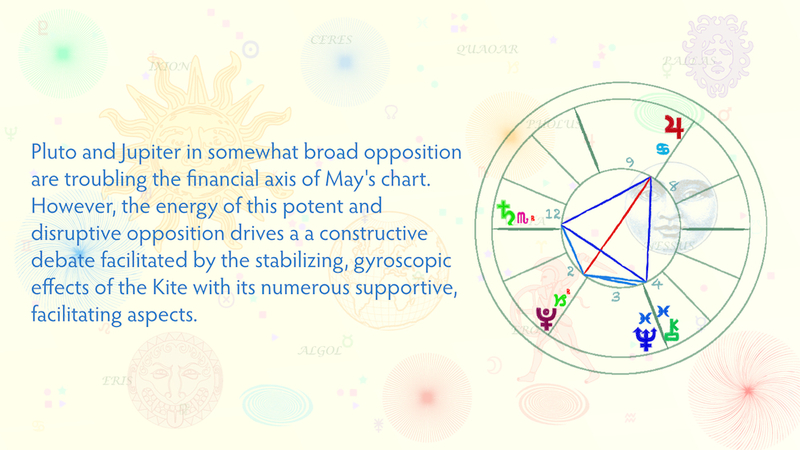 Pluto and Jupiter in somewhat broad opposition are troubling the financial axis of May's chart. However, the energy of the opposition drives a debate facilitated by the stabilizing, gyroscopic effects of the Kite with its integral system supportive, facilitating aspects. The Pluto/Jupiter opposition linking the base and the apex of the Kite tells us that conflicts will boil down to an essentially philosophical or ideological argument over the economic rights of the 99%. They are waking to the economic and political imbalance and beginning to reclaim their economic power. Pluto anchors the Kite solidly in Capricorn in the 2nd house, the houses of grassroots economics. This is a very concrete, down-to-earth, realistic placement. Neptune and Chiron in Pisces on the cusp of the 4th house bring inspiration and healing. This is a deeply spiritual and psychological placement. It floods our minds with spiritual and healing energies. Jupiter is exalted in Cancer in the 9th house of philosophy and ideology. This is a deeply thoughtful, intuitive, high-minded placement with a focus on nurturance. Saturn retrograding in Scorpio in the 12th house of spirituality gives the economic debate a spiritual moral dimension and foregrounds the need for personal discipline and integrity. + a Yod . . .
Uranus conjoined Venus in Aries in the 5th sextiles Mercury in Gemini in the 8th. Both placements are quincunx Saturn retrograde in Scorpio in the 12th. Together they form a Yod. The Kite makes for a fast-moving, wide-ranging, inclusive debate. It also expands the range of concerns being addressed. It also forestalls polarization and encourages compromise and improvisation. But the Kite can also have a homogenizing effect that could easily obscure or divert attention from key issues. The Yod will reliably counteract this homogenizing tendency. The Yod provides a separate, distinct energetic focus. It will ensure that certain very specific and important issues will not get lost in the shuffle, bargained away in the quest for compromise or the active search for workable alternatives. The Yod will set up a kind of persistent, round robin debate over certain specific issues. In this way, it will maintain the integrity of these issues and keep them in the forefront. This particular Yod foregrounds the importance of moral and economic discipline. 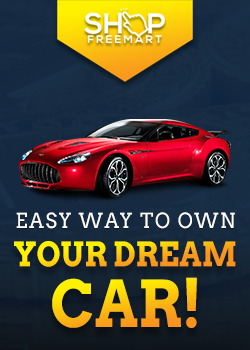 Economic fairness will not, for example, deteriorate into a drive for cradle to grave financial guarantees. Nor will it leave out the issue of personal responsibility and accountability. Instead, May's Yod will keep us mindful of the need for individual tradeoffs and accommodations to help resolve larger economic issues fairly and realistically. This Yod foregrounds the need for shared sacrifice and possibly uncomfortable personal adjustments. We will be willing to adjust our personal, and social lives (Uranus and Venus in Aries in the 5th) and our long-term financial plans (Mercury in the 8th) to find workable solutions. Saturn retrograde means that realism, fairness and common decency will influence the reshaping of our expectations. This Yod is powerfully placed, too, tucked right into one of the Kite’s angles. It injects a concern for fairness and common sense into the the difficult and fateful proceedings. 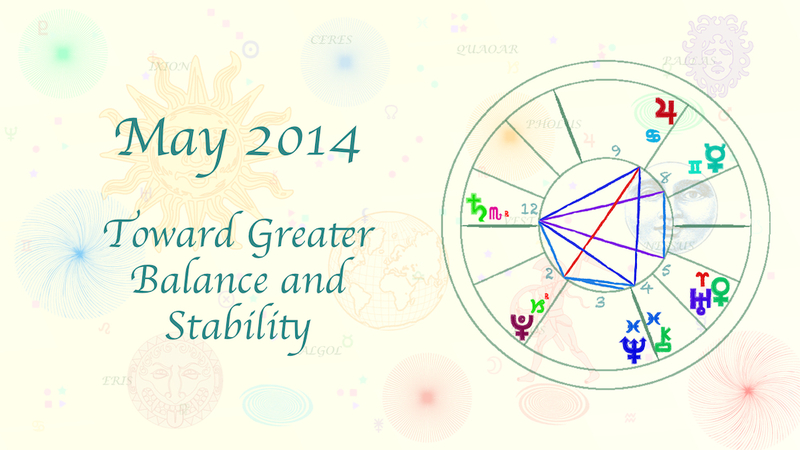 On one level, May’s chart tosses an abundance of disruptive and divisive energies at us. At another level, it provides stabilizing, adaptive, supportive energies (the Kite) and an important additional focus (Yod) making sure that key issues are not glossed over. The dynamic generated by this structure is hard to predict, control or distort. It’s inclusivity provides a multiplicity of voices that will act as an effective system of checks and balances. It has a progressive, conciliatory cast that would be very difficult to frustrate. One also has to participate actively and earnestly on many fronts to have an influence on the outcome. A small, entrenched elite cannot rely on political inertia to preserve the status quo. Nor can a small army of lobbyists and paid political operatives counter the many facts and varied opinions flowing into the debate. May’s chart provides a robust alternative to polarization and confrontation. It is highly unlikely that we will allow a settlement that leaves the status quo in place on any count. In the end, we are left wondering whether this constructive, transformative dynamic will become a permanent feature of our public life, and hoping that it will.